Who Am I? 1 Comment ChristIdentityNew LifeWho Am I? Well, here we are! The Monday after Easter Sunday! I hope your services went well and that you were blessed by the truth of the gospel! We had two baptisms at our church this Sunday! No, this was not spontaneous, but what better day to have a baptism than the day that Christ arose! It was a beautiful picture to the congregation of the reality that we all face if we are in Christ. We have been buried with him in death and we have been raised with him in new life! Today, we will look at another facet of our identity in Christ. 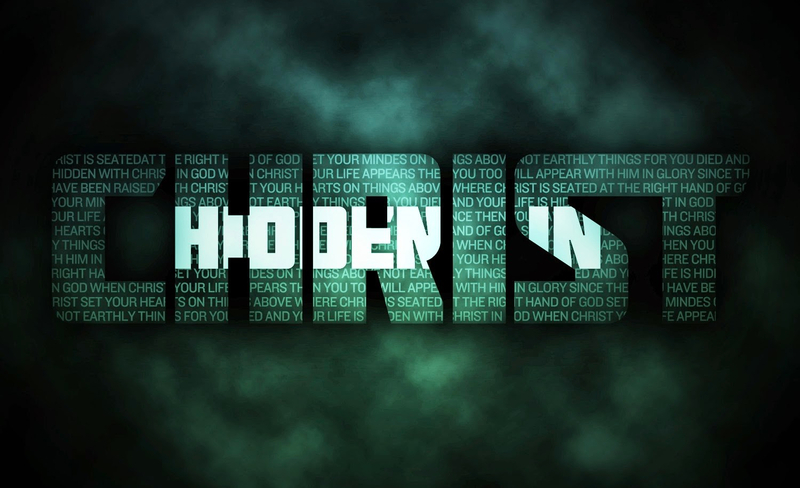 We are hidden with Christ in God. Let me illustrate this truth with Scripture. 3 If then you have been raised with Christ, seek the things that are above, where Christ is, seated at the right hand of God. 2 Set your minds on things that are above, not on things that are on earth. 3 For you have died, and your life is hidden with Christ in God.4 When Christ who is your life appears, then you also will appear with him in glory. If you had just read Colossians 3:3 by itself you would miss the context of the passage. Thus, you would also miss the meaning of verse 3. For example, what would it mean for you to have died? Is that physical death? Most of us understand already that it is not physical death, but you would certainly miss what Paul is getting at if you only read verse 3. 3 If then you have been raised with Christ, seek the things that are above, where Christ is, seated at the right hand of God. Verse 1 reminds us, much as Easter should, that we are raised with Christ. In order to be raised something else must happen first. We must die and be buried. Then, just as Christ has been raised from the grave, we too, if we are in Christ, are raised with him! This means we should no longer set our minds on the things that are worldly, but the things that are heavenly. That is where Christ is after all. We must have our minds set on Christ if we are in Christ. He is the one who opened the door for us to enter in. Without the cross and without the resurrection we would have no hope. But, by Christ’s work, we are presented righteous, washed from sin, and pure before God. We were crucified with Christ and raised to newness of life. Christ’s life. This is our key verse, but the answer to how we are hidden in Christ cannot come yet. We need the whole passage to see what this means. So, I will come back to this verse! At this present time, we truly are before God in Heaven because we are hidden with Christ. But, there is a day coming where we will appear with him in glory! But, until that day comes we best be doing something other than just waiting around. We should be conforming to Christ! If we are in Christ we should look like Christ. How is this done? The last half of this passage answers this question. Put off and put on. Put off those things for which Christ died for. Put off or kill your sexual immorality, your impurity, your passion (lust or evil impulses), your evil desire, your need to have someone else’s stuff, your desire to make other things your god instead of the LORD, put off your anger, wrath, murderous thoughts towards others, your degrading talk of others, your obscene talk(or filthy language), your lying, and any other evil practice you had before coming to Christ. After putting all that off then put on something new. Namely, put on the new self, which is Christlikeness. Being hidden with Christ means that you no longer look like your old self. You should be conforming to the image of the Savior. Being hidden with Christ means that is no longer your old self that God the Father sees, but it is his Son that is perfectly righteous and pure that he sees. Put off the old self and put on Christ, for you are hidden with him in God.